← Let’s Share The Crafting Excitement! Though cross stitch is a fun and relaxing hobby for people who stitch, for the designers who create the charts, some times cross stitch is an exercise in frustration. Whether you’re working on aida, evenweave or linen, you are stitching X’s on the fabric, mimicking the squares on the instructional chart. This is fine and dandy in large areas or when making other boxy shapes, but for many of the characters in the Disney Dreams Collection, these squares can be very challenging when it comes to achieving the curves and proportions needed. That’s where fractional stitches are the unsung heroes – dividing each stitch into four smaller stitches and using them in a variety of combinations. Many stitchers, sometimes myself included, find these stitches tedious, but when they’re done properly they make a tremendous difference in the finished project. The folks at MCG Textiles include very clear stitch guides in their kits, but experienced stitchers often don’t read the instructions or the stitch guides. That is unfortunate because in order to achieve the effect that MCG’s stitchers achieve it is important that the stitches be done as illustrated. 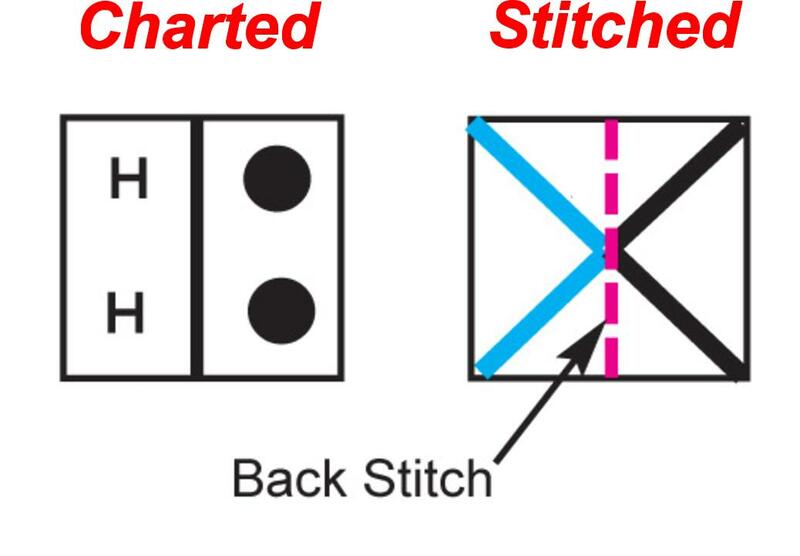 The basic premise in MCG’s stitch guides is that an X is made up of four quarters, or four CORNERS. A quarter cross stitch, indicated by a small symbol in one corner of the chart, fills ONE quarter, or one corner only. Do not be tempted to also make a long diagonal stitch from one corner to another, thereby filling three-quarters, or three corners, of the square. If there are two small symbols in opposite corners in the square then stitch both corners only. In both scenarios there will always be a back-stitch line – when stitched that will fill the rest of the square. Because the characters in the Disney Dreams Collection designs are small, sometimes the designer has to divide a full stitch horizontally or vertically. 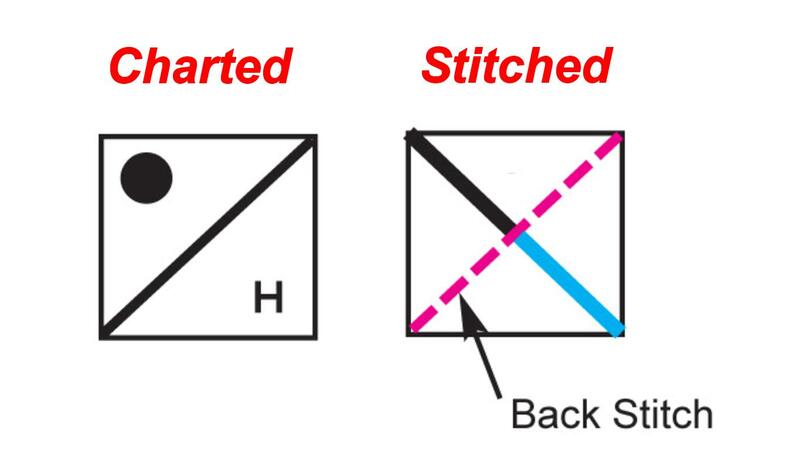 In this scenario, the four quarter stitches fill the square but a back-stitch is still necessary to match up with the rest of the outlining of the character. Though it doesn’t happen often, there are times when three or four colors are used in one square. When this happens, at least one of the quarter stitches will have back-stitches around it. For all you stitchers who prefer to stitch the three corners with your floss color, this stitch is for you! It’s called, appropriately so, the three quarter cross stitch! 🙂 This stitch is done ONLY when there are two small symbols in two DIFFERENT squares with a diagonal back-stitch line that goes across both squares. Though the fourth corner doesn’t have a stitch in it, the combination of the back-stitch line plus the other three corners being filled fills that fourth corner. Since you’ve been so patient with the technical explanations, here are some close-ups of stitched images. Here is Belle from Beauty And The Beast Falling In Love. Can you see examples of all three stitches described above? 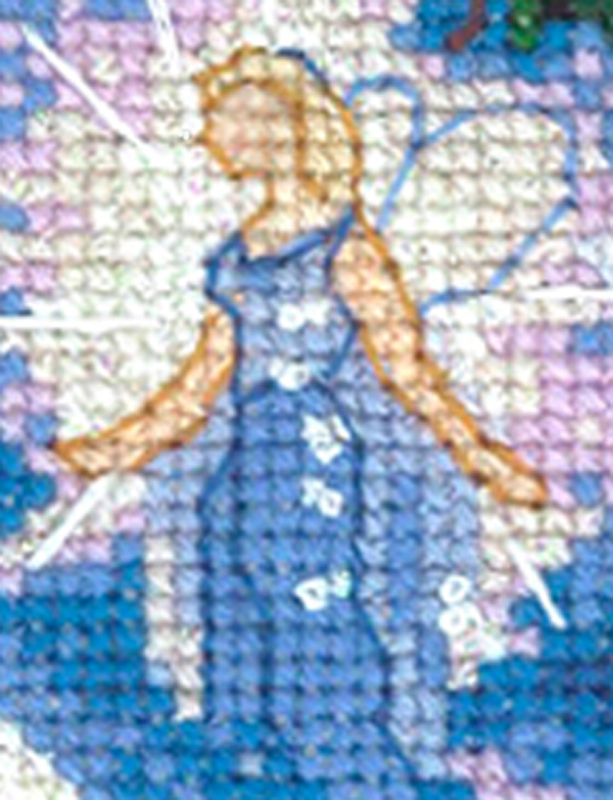 The Blue Fairy from Pinocchio Wishes Upon A Star has two of the three stitches…do you know which ones? 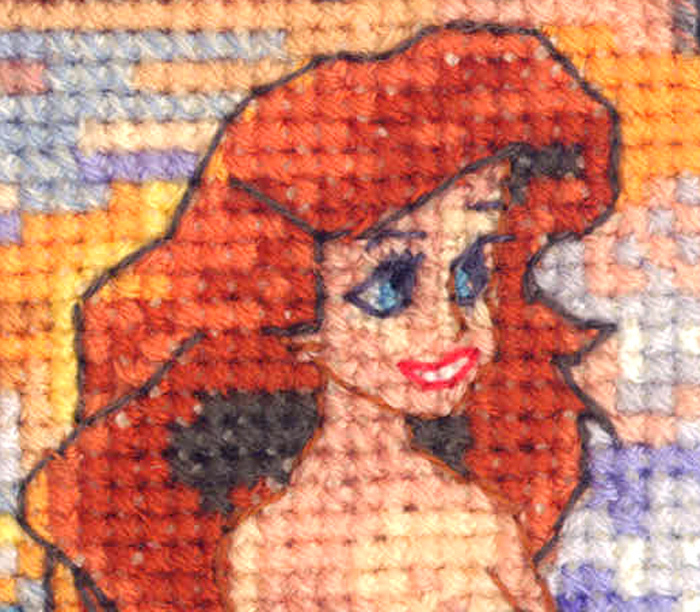 And here’s everyone’s favorite mermaid..can you identify which fractional stitches are used to make curves out of squares? I hope these explanations have helped you appreciate the usage of the fractional stitches and that you have an understanding of how to execute them the way that MCG Textiles intended. 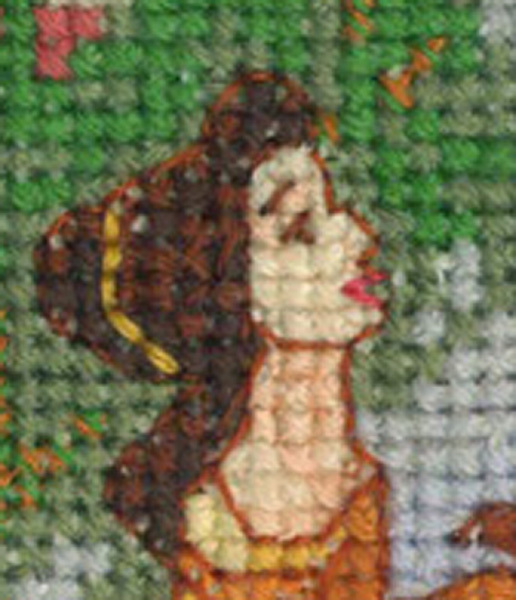 This entry was posted in Cross Stitch, Tips & Tricks and tagged cross stitch, Disney, Disney Dreams Collection, Fractional Stitches, MCG Textiles, Stitch Guides. Bookmark the permalink. Let’s Share The Crafting Excitement!